On top of all of the crap I'm packing for our trip today, I decided to make some caramel corn to bring for my parents' party on Saturday. I'm not actually sure this is going to make it beyond our 10 hour drive though, its so addicting! 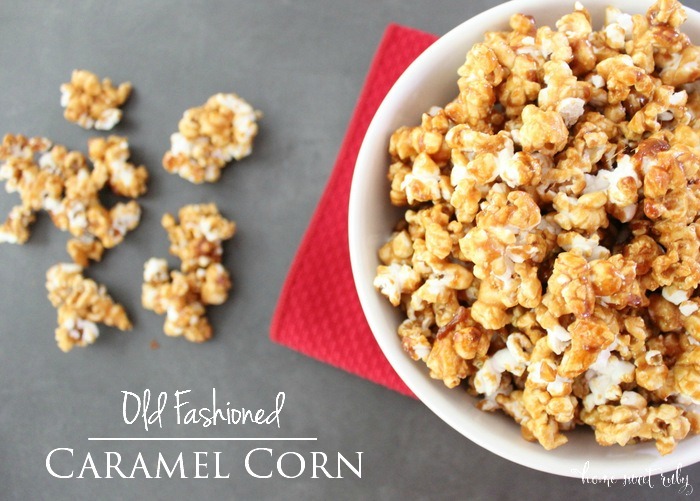 I thought homemade caramel corn would be difficult, but I actually ended up having most of the ingredients already and its super easy! Also I'm not sure why I'm calling this "old fashioned" because this is the first time I've tried this recipe, but it sounds really delicious, doesn't it?! ha! 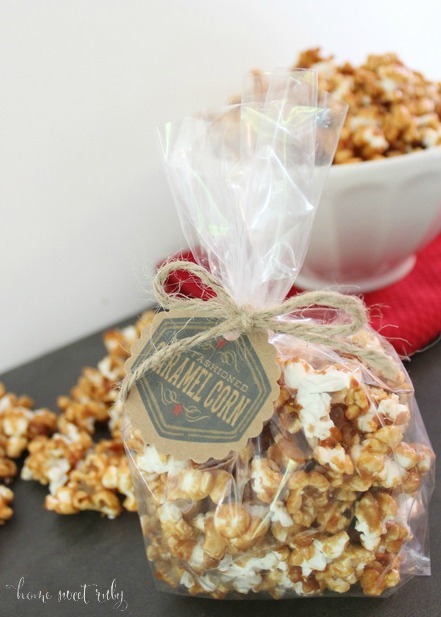 Preheat oven to 300 degrees F. Make your popcorn in the microwave and put it in a large mixing bowl. In a medium saucepan, add the butter and let it melt over medium-high heat. Then add corn syrup, brown sugar, and salt. Bring mixture to boil for about 2-3 minutes, stirring continuously. Remove from heat and add your vanilla and baking soda. 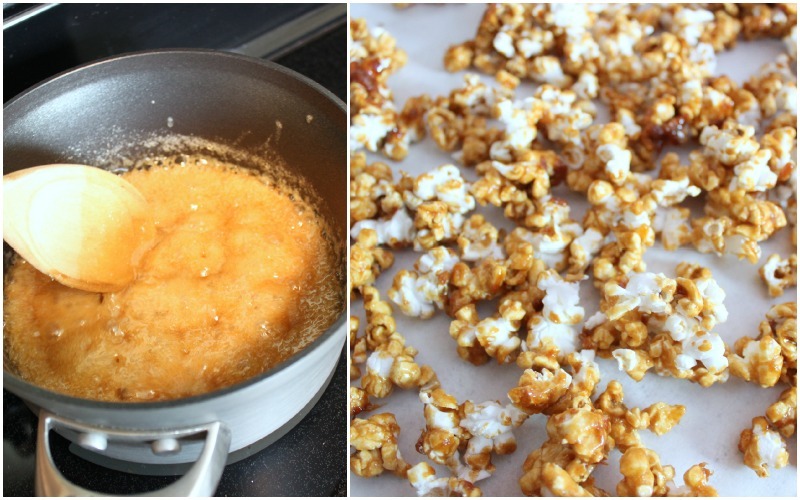 Pour the caramel over your popcorn and mix it with a spatula to coat the popcorn. Then, transfer the popcorn to a cookie sheet lined with parchment paper. Bake for 20 minutes, then stir the popcorn again. Bake for another 20 minutes or so and remove from oven. 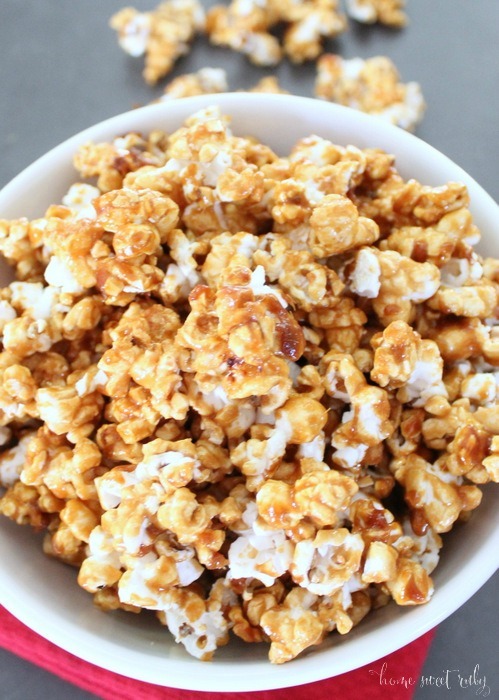 Stir the popcorn again before the caramel melts so that everything is coated. Once the popcorn is cooled, you can break it up into smaller pieces. Keep in airtight container or eat it all in one sitting. I'm telling you, its that good! I made a little bag up to give to our neighbor for watching over our house while we're out of town, and I'm convinced its the cutest favor ever! That's it for me for the long weekend! I hope you all have a very safe, festive, and fun Fourth of July! 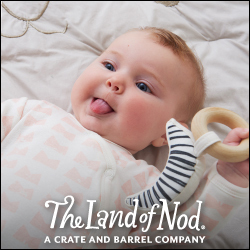 Oh yum - you'll definitely have to pack that up in the trunk or it's going to be way too tempting. Drive safe and have a wonderful 4th! My mom made this only once we I was little, but it is SO good. Thanks for sharing the recipe!! Have a great 4th! That would be such a great gift and lets be real I'd eat it all before taking to someones house haha! Yum, sounds so good! I've never had homemade. Flash giveaway at my blog - today only. Cait!! This looks SOO yummy!!! I may have to make this for the 4th! Wow girl that looks delicious! I have never tried to make it on my own but this looks so simple. This looks sooo good! And so easy - I'm almost scared to try it because we'd probably have it ALL the time! Hope you had a wonderful holiday! 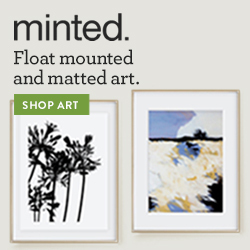 This looks great... and I love your pictures!